Chrysothemis is a genus of nine species native to the West Indies, Mexico (Chiapas), Guatemala to Colombia, Venezuela, Guyana, Surinam, French Guiana and Brazil (Amazonas State). It grows in shaded areas along roads and streams in wet forests. The genus is distinguished from other long-stemmed genera in the Paradrymonia Alliance by the absence of adventitious roots, a terrestrial erect and free-standing habit, the presence of tubers and prominent, often colorful calyx lobes of red or yellow with yellow, orange, purplish or white corollas, sometimes with red markings. 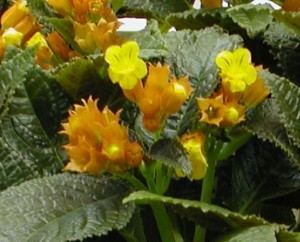 Chrysothemis has long been in cultivation, and forms of species such as C. pulchella and C. friedrichsthaliana are often seen growing outside in subtropical summer gardens, as well as indoor collections and are often exhibited in flower shows.